Your life story in a custom video biography. Welcome to the August issue! I hope you’re having a great summer! This month, I’m proud to announce that Family Legacy Video’s website is now smartphone-friendly. You’ll also get a glimpse of a family snapshot from the 1890s. I hope you enjoy this issue of the Family Legacy Video® Producer’s e-Newsletter. Please e-mail me at steve@familylegacyvideo.com or phone toll-free (888.662.1294) with any questions or comments you have. Family Legacy Video’s website goes mobile! A good website is an important part of the marketing mix for most companies, Family Legacy Video® included. In years past, as long as your site looked good in a variety of browsers on a computer desktop, you were pretty much okay. That’s not the case any more. With the growing number of folks using smartphones and tablets to access the Web, effective sites need to be optimized for a wide range of devices and screen sizes. In fact, you may be reading this newsletter on a smartphone right now. Bowing to this reality, Family Legacy Video’s site is now mobile-friendly. If you have a smartphone or tablet, please do visit the site and let us know how it works on your device. We’d certainly appreciate the feedback. Some tips: First, if you’re planning on creating a new site from scratch, make sure it’s mobile compatible from the get-go. It’ll save you hassle later getting it converted. Second, if you already have a site, don’t wait to optimize it. You could be losing valuable traffic from mobile users who can’t navigate through your site on those tiny screens. Third, make sure you hire a web programmer who knows what he or she is doing. A professional will have the expertise and experience you’ll need to make the process as efficient and pain-free as possible. Old glass plates reveal family life in the 19th century. If you were a photographer in the 1800s, there was no such thing as point and shoot. In fact, you spent a lot of your time just preparing the plates onto which you exposed your photos. First, you needed a clean glass plate. Then you coated it with a thin solution made of egg whites. Over the egg whites you wiped on a mixture containing guncotton, alcohol and bromide salts. Then you dipped the plate into a solution of nitrate of silver, which was the sensitizing agent. Oh, and you had to do this in the dark. While the plate was still wet, keeping it shielded from light, you slid it into the back of your camera. Then you could finally take the picture. Because of how tedious this process was, it’s not hard to understand why very few amateurs went around taking snapshots. That all changed in 1880, when George Eastman patented a machine for dry-coating photographic plates. Taking photos became less expensive, easier and more accessible to amateurs. In the late 1890s, one of those amateur photographers shot over a hundred images of rural family life in Rockford, Illinois. The glass negatives containing those scenes spent over a century stored in attics and garages. A descendant of that long-ago shutterbug passed the boxful of plates to me, hoping I might be able to bring the photos back into the light of day and incorporate some of them into a video biography. I have to say, I was excited by the prospect. I’ve read about glass negatives, but have never seen them. 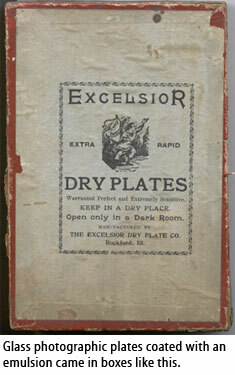 Most of the plates were about 3 inches by 4 inches, with a smaller number being about 4×5. Despite the fact they’d been stored in glassine envelopes, five to an envelope and laid horizontally in a cardboard box amongst crumbled newspapers, most of the plates were in surprisingly good shape. My main concern was, of course, to not damage the plates. Wearing white cotton gloves (one forum I read recommended latex gloves to avoid snagging threads on the rough edges of the plates, but I found cotton gloves easier to put on and take off and so used those), I concentrated on one envelope at a time, removing the plates and lining them up on clean, white paper. Luckily, I have a scanner that does a great job with transparencies. I scanned the negatives one at a time, placing each emulsion side down (the emulsion side is the dull side) on the glass plate of the scanner. With each scan, another scene of farm and family life filled my computer screen. It was a great process of discovery; I even spotted my client’s father, a young boy then, sitting astride a harnessed plow horse. Now that they’re in digital form, these photos have a new lease on life. My client’s family will have a chance to share and enjoy them, and I’ll be incorporating some of them into my client’s upcoming legacy videos. I also plan to secure proper storage envelopes and containers so the original plates can be protected for years to come. By the way, I didn’t break a single one – whew!